Dušan shares more pictures of his recumbent trike that he's been touring on as a distance traveling bike. With greetings, Dušan from Slovakia"
StreetFox Recumbent Trike is a fast and comfortable version of the classic "tadpole" style trike (two wheels in the front), which includes rear suspension, three wheel braking, and 26 inch rear wheel for optimal gear range. 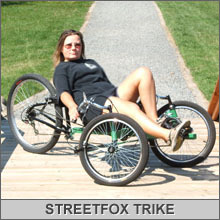 The StreetFox looks and handles as good as any commercially produced trike, and can be completely made using commonly available and inexpensive bicycle components and some square tubing. Not one single machined part is needed. The StreetFox has an adjustable bottom bracket so it can fit riders of most heights, from 5 feet to well over 6 feet tall. Due to the rugged construction and use of sturdy 14 mm axle, 48 spoke front wheels, the StreetFox can easily accommodate riders over 250 pounds. 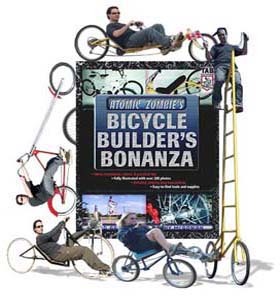 Take a look at our Builder's Gallery to see other StreetFox recumbent tadpole trike examples, including many creative modifications to the plan. Our international builders community ranges from students to retired engineers, but they all have one thing in common - the desire to build their own stuff! Crazy old skool tall bike for two! Netherlands bike chopper - wicked! Ohio StreetFox recumbent tadpole trike kicks gas!